Soave Superiore Classico DOCG. Product of Italy. This elegant white has been made using the finest Garganega grapes hand picked on Italy's Soave Classico hills. Partially aged in oak for 10 months, its mineral character is balanced with layers of ripe citrus and stone fruit flavours. 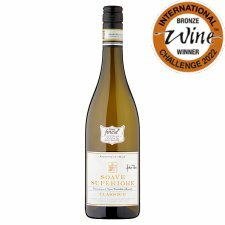 A refreshing yet rich dry white with flavours of peach, apple and citrus with the characteristic notes of almond blossom typical of top quality Soave. INGREDIENTS: Antioxidant (Sulphur Dioxide), Potassium Metabisulphite.